Much has been written over the last several days about the political and economic repercussions of Trump’s decision to pull the U.S. out from the Paris Climate Agreement. It’s been pointed out that the decision will diminish our standing in the world and cast us in the role of a rogue state, a pariah among nations. Our economy will languish, overtaken by other countries that make the leap to full reliance on clean energy. The mantle of global leadership will pass to Europe and China, and we’ll find ourselves increasingly isolated on the international stage. To be an American abroad will become a mark of shame. 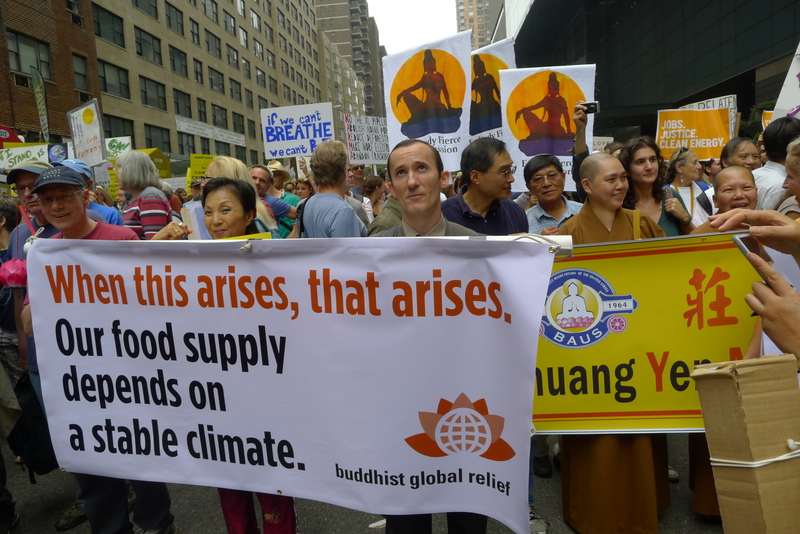 A “Rolling Retreat” of dharma teachers and practitioners, by the busload, helped Buddhists to join Saturday’s People’s Climate March in Washington, D.C. Stepping off the Buddhist retreat bus in D.C. on Saturday, two things were apparent: the 2017 People’s Climate March was going to be huge, and it was going to be hot. 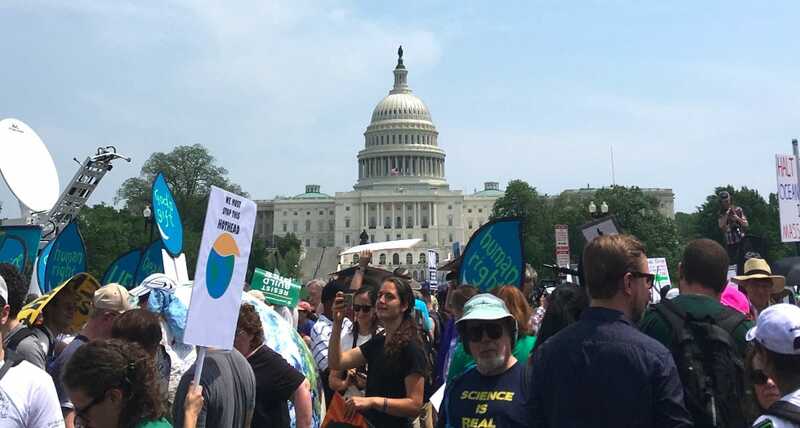 The record-breaking 92-degree heat seemed to enhance the energy of the staggering crowds that had convened to march from the foot of the Capitol Building to surround the White House. I’d chosen to march with the Buddhist contingent as part of the Faith Bloc, situated between the Science bloc and Fossil Fuel resistance groups that gathered to surge down Pennsylvania Avenue. It was Trump’s 100th day in office, and over 200 Buddhists from around the world had shown up to make their voices heard with another 200,000+ people. The common message was clear: we know the climate is changing, and we want to address this. Suppose I was a bus driver driving a busload of people along an unfamiliar route and at a certain point my GPS device showed me that I was heading toward a precipice. I would not assume that the device is mistaken or argue that the accuracy of such devices is a matter of debate. As I got close to the edge of the abyss, I would not jiggle the steering wheel, much less step on the gas pedal. Rather, I would turn away and head in a different direction. Yet, expand this picture to a global scale, and it shows us exactly what we’re doing with our climate. The climate crisis is probably the gravest danger that humanity has ever faced, the precipice toward which we are heading, yet those in the driver’s seat are doing just what the reckless bus driver does. They’re insisting that the great majority of climate scientists are mistaken; they’re claiming there is still a debate about the causes of climate change; they’re attacking investigators who seek to hold offenders accountable; and they’re stepping on the gas pedal with policies that will push carbon emissions to perilous heights. If they continue to have their way, they’ll drive the bus of humankind over the edge to a fate we can hardly envisage. The standoff at Standing Rock offers a choice between two worldviews: one that can lead to a new economy of shared prosperity and one that will hasten the devastation of the planet. (Photo : NASA/Public Domain) Hurricane Matthew as captured by the Moderate Resolution Imaging Spectroradiometer (MODIS) on NASA’s Terra satellite hours after the storm hit the southwestern region of Haiti. BGR began its relationship with Haiti in 2010, when we launched a partnership with the US-based What If Foundation to provide meals to hungry children in the Tiplaz Kazo neighborhood of Port-au-Prince–children who were left mostly homeless by the powerful earthquake of 2010. Since then our relationship with the island-nation has grown ever closer, and we have formed partnerships with several other organizations working in the island, including Oxfam America, the Trees That Feed Foundation, and the Arts Creation Foundation in Jacmel. This past April, our vice-chair and treasurer, David Braughton, visited the country to attend the ribbon-cutting ceremony for the new Father Jeri School established by the What If Foundation to provide free education to children who would otherwise never have had the chance to attend school. 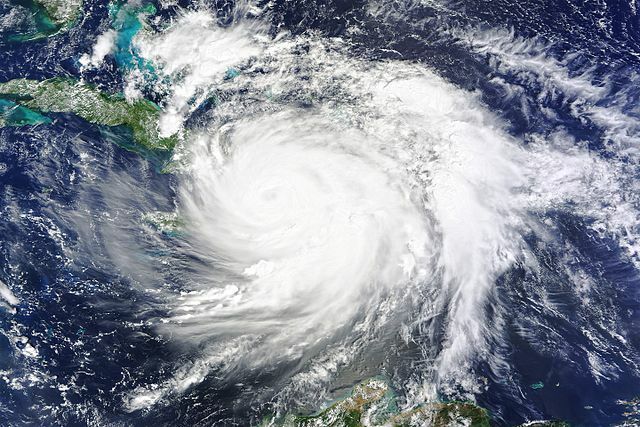 Just last week, Haiti was slammed hard by Hurricane Matthew, which swept over the island, leaving in its trail widespread devastation, shortages of food and fresh water, power failures, and a death toll of over a thousand. BGR responded immediately to the disaster. Meeting by email, we decided to provide emergency aid to three organizations. We made a $5,000 donation to the What If Foundation for food assistance through its partner on the ground, Na Rive, in Port-au-Prince; a $5,000 donation to CARE for emergency relief to the Jeremie and Southwest regions of the island, which were hit especially hard; and a donation of $3,000 to BGR partner, Trees That Feed, to assist with its feeding program and general recovery. Though BGR is not an emergency aid organization but sponsors long-term development projects, we will closely monitor recovery efforts in the country after the hurricane to see how we can help most effectively in ways that correspond to our mission of combating hunger and malnutrition. The Central Rift Valley is Ethiopia’s predominant vegetable production belt. 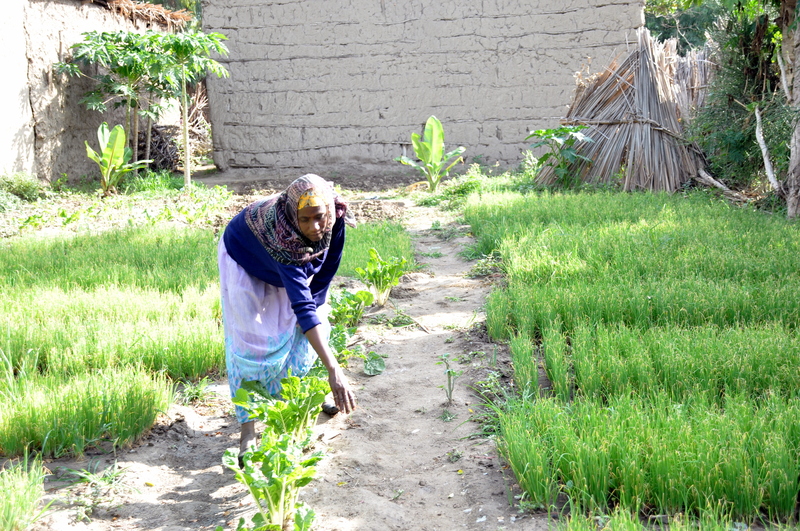 In this region, there are over 20,000 smallholder farmers engaged in producing over 200,000 tons of vegetables per year on about 10,000 hectares of irrigated land. Despite access to irrigation, agricultural practices have remained traditional, irregular, and unsustainable in terms of their economic, social, environmental, and ecological impacts. The agronomic practice and input application patterns are not only haphazard but also cause significant damage to the soil, water, ecology, and human health. 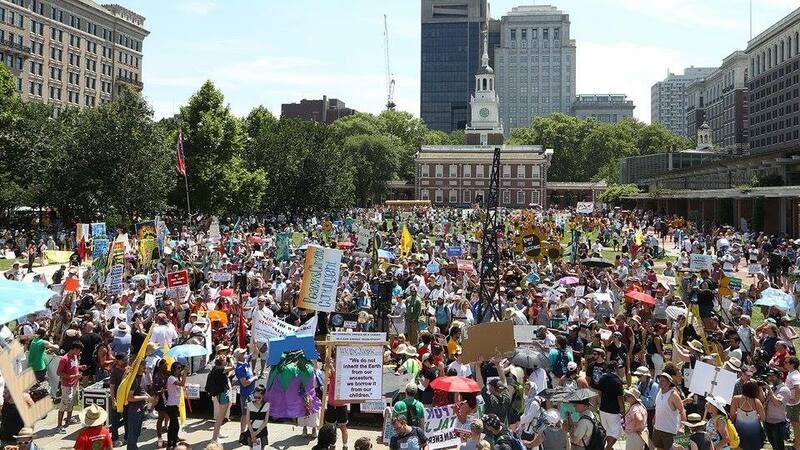 Yesterday, on July 24, 10,000 people came together in Philadelphia to join the March for a Clean Energy Revolution, held on the eve of the Democratic Party’s National Convention. In Philadelphia, the temperature broke the 100 mark, but marchers remained undeterred. Their purpose in coming together was to urge our political leaders to act quickly and effectively to ban fracking, keep fossil fuels in the ground, stop dirty energy, transition to 100% renewable energy, and ensure environmental justice for all. 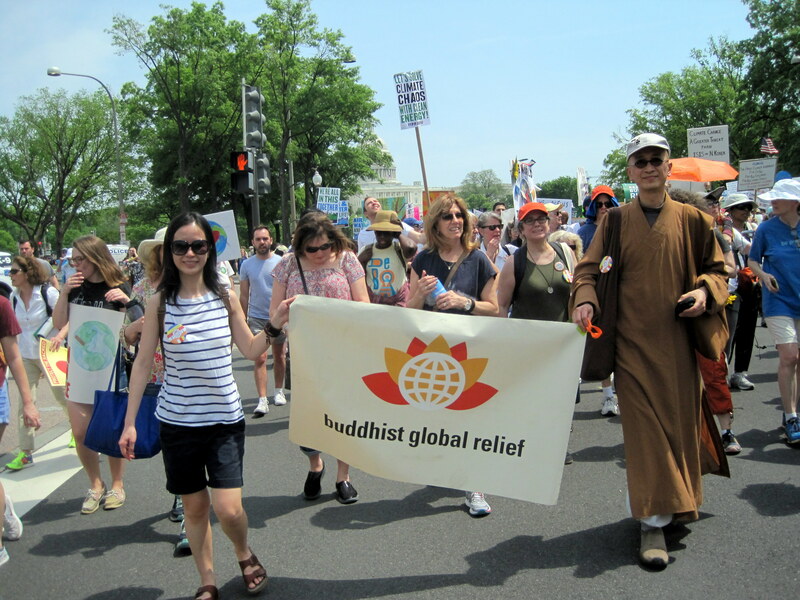 Members of the BGR team and other Buddhists were among those on the march. BGR participants included Sylvie Sun, Charles Elliott, Marcie Barth, and Regina Valdez. Also joining were Rev. T.K. 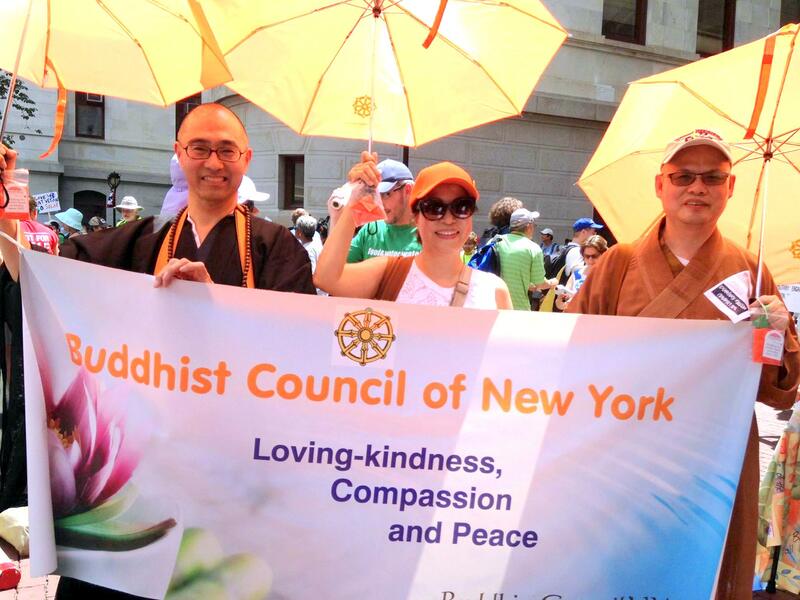 Nakagaki of the Buddhist Council of New York, Ven. Ru Fa of the Chinese Buddhist community, Bob and Sarah Kolodny of Buddhist Climate Action Network NY, and East Coast members of the Plum Village Sangha.